Puckett pulled out a letter written by an unnamed AVSC athlete about how much getting up on the hill meant to the child, whose parents are getting divorced. Without the funding brought in from events like Saturday's Quick read more or view full article Audi Ajax Cup, that child might never have the opportunity to make turns and put those worries aside. 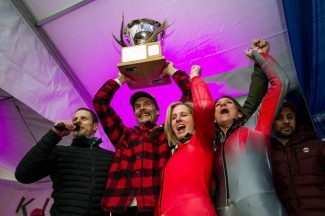 "I spent my life in skiing and ski racing and there is nothing more rewarding than creating opportunities for others in the future," said big mountain ski icon Chris Davenport, who co-chairs the Ajax Cup with Puckett. "I'm so proud of the Aspen Valley Ski Club for their commitment to offsetting the cost of the sport, because it's expensive. It's one of our most important missions — making skiing and snowboarding affordable to everybody so no kid is left out of the club." The Ajax Cup, held for the eighth time on Saturday, is the AVSC's largest fundraiser. Last year it brought in about a half million dollars for the club, and Executive Director Mark Godomsky expected this year's number to wind up in the same range, if not more. "We are not done yet, but I think this will be our most successful Ajax Cup, ever," Godomsky said. "It's really neat to watch a community rally around an organization and raise money to give kids an opportunity." The AVSC once stuck with a traditional gala dinner to raise its money, but that just didn't feel right. So eight years ago the idea of instead doing ski races was born. The Ajax Cup is a 16-team, parallel giant slalom and has no shortage of elite talent. 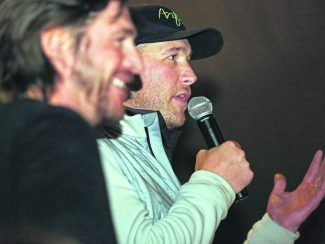 Each of the 16 teams has its own "pro" skier, and this year's featured guest was none other than Olympic gold medalist and two-time overall World Cup champion Bode Miller, arguably the greatest male alpine skier in U.S. history. Miller's participation was planned, as was NASCAR driver Jimmie Johnson's, a part-time Aspen resident who has now competed in three Ajax Cups. However, many surprises were had, such as fellow NASCAR icon Dale Earnhardt Jr. tagging along with Johnson and donating a day on the track with the duo as an auction item, and Aspen's Wiley Maple making it in time to take Davenport's spot as one of the pros. "He was amazing," Davenport said of Maple. "That's the kind of dedication that when you grow up in AVSC, you are part of a bigger, extended family of athletes. It was an amazing day. I'm still kind of spinning from it." Team Super-G! won the Gorsuch Cup — awarded to the last team standing at the Ajax Cup — edging team M.A.G.S. in the final. An acronym for "Middle Aged Guys on Skis," team M.A.G.S. included Johnson, who made his first finals appearance. "Nyberg, in his first year at AVSC, won the time trials, he won the $500 lottery and his team took it to the end," Godomsky said. "It's awesome. It shows the quality of staff we have at the AVSC." Among the last-second auction items was a half-day ski day with Vail's Lindsey Vonn, the four-time overall World Cup champion who is largely considered to be the greatest female ski racer of all time. Vonn, who didn't make it in time for Saturday's races, will be in Aspen for a few days training ahead of February's Winter Olympics in South Korea. That said, even Ryan can't begin to imagine what it would be like to again be a teenager and get the chance Quick read more or view full article to ski alongside Bode Miller. AVSC Base Camp Highlands Programs meet in the AVSC Clubhouse parking lot for drop off. It is important that we create a safe and effective drop off experience for our families. Having volunteer help is a critical piece to making this happen! This article was originally published in the Aspen Times by Mark Godomsky, AVSC Executive Director. Last week, over 350 Aspen Valley Ski & Snowboard Club Base Camp scholarship athletes lined Durant Avenue in Aspen, eagerly waiting their turn to pick up their ski and snowboard equipment from Gorsuch and D&E/Four Mountain Sports. Many athletes were picking up their first set of equipment, while others spoke enthusiastically of returning to a sport they've come to love. Skier or snowboarder, new or returning, the common denominator for all kids in attendance was Quick read more or view full article sheer excitement for the season ahead and hands full of equipment, generously donated by both stores. AVSC's Base Camp program is an incredibly unique program for a ski club. 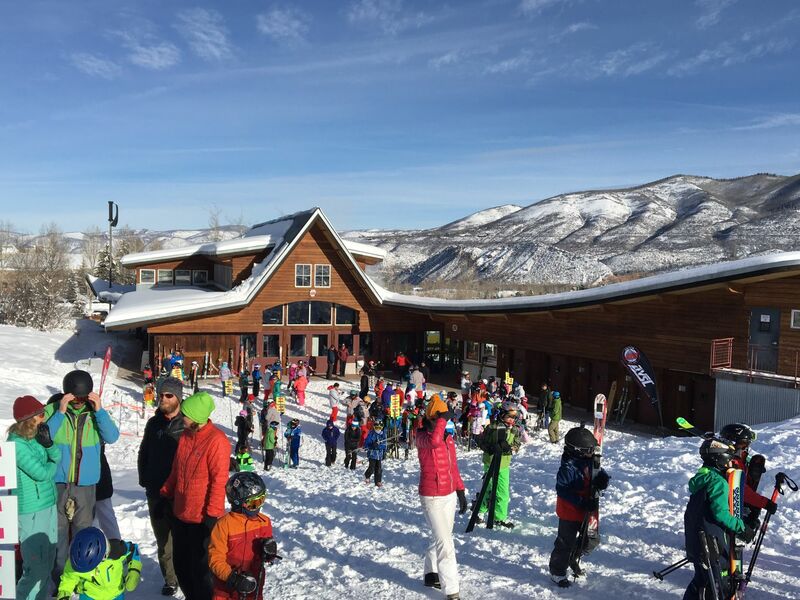 Very few competitive ski clubs have a recreational component, and no other club in the nation has a recreational program that compares in size to Base Camp, which this year consists of 1,600 athletes from age 3.5 to grade 12. Even more rare is the ability to provide financial assistance to children in a recreational program; this year we gave scholarships to 417 Base Camp athletes. The presence of, and commitment to, the Base Camp program in Aspen illustrates the strength of our community and commitment to our youth. Aspen Valley Ski & Snowboard Club could not reach as many children in the Roaring Fork Valley if it weren't for our donors and community partners — from Aspen Skiing Company providing the pros to teach our athletes, the schools from Glenwood to Basalt opening their doors to us and allowing us to host registration nights, to Gorsuch and D&E/Four Mountain Sports going above and beyond by providing equipment to kids who might not otherwise have the opportunity to participate. Last Tuesday was also Colorado Gives Day, a day to support and celebrate non-profits across the state. 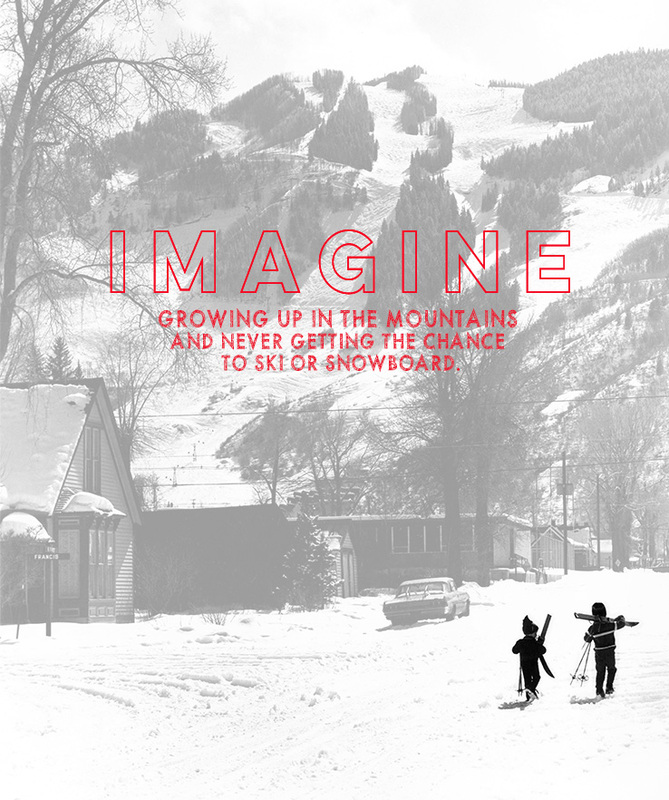 At AVSC, we asked our community to imagine growing up in the mountains and never getting the chance to ski or snowboard. We are so grateful for all who support AVSC and help us try to prevent that from happening in our valley. Now, imagine walking into Gorsuch only to have your first pair of boots fit by Jeff Gorsuch himself, then get those boots fitted to a pair of skis and walk out with all of it to use for the season, at no cost to you. That was reality last Tuesday for many of our athletes, and for that we are so grateful. A huge thank you goes to Jeff Gorsuch and the team at Gorsuch, and Derek Johnson and the team at D&E/Four Mountain Sports. Your patience and care in ensuring the best equipment fit for each and every individual athlete was tremendous. What a great way for them to start their season ­— thank you. Cassidy Jarrell has been in plenty of halfpipes, but none have meant quite as much as the one this week at Copper Mountain. "It is so big," Jarrell said after training Tuesday. "Just standing at the top and looking around, I used to watch all these guys on TV. I'm like, 'Damn, how am I standing next to all these guys?' So it's huge for me." Jarrell, an 18-year-old senior at Aspen High School, looks to become the next great Quick read more or view full article halfpipe skier from Aspen, following in the footsteps of Torin Yater-Wallace and Alex Ferreira. While Yater-Wallace, a 2014 Olympian, and Ferreira, a winner on the World Cup and Winter X Games frequenter, are savvy veterans, Jarrell is just now entering the world of big-time competition skiing. So far this winter he's landed two major invites, beginning with this week's Copper Mountain Grand Prix. The competition also is the first of four remaining Olympic qualifiers, which includes the January event at Aspen Snowmass. 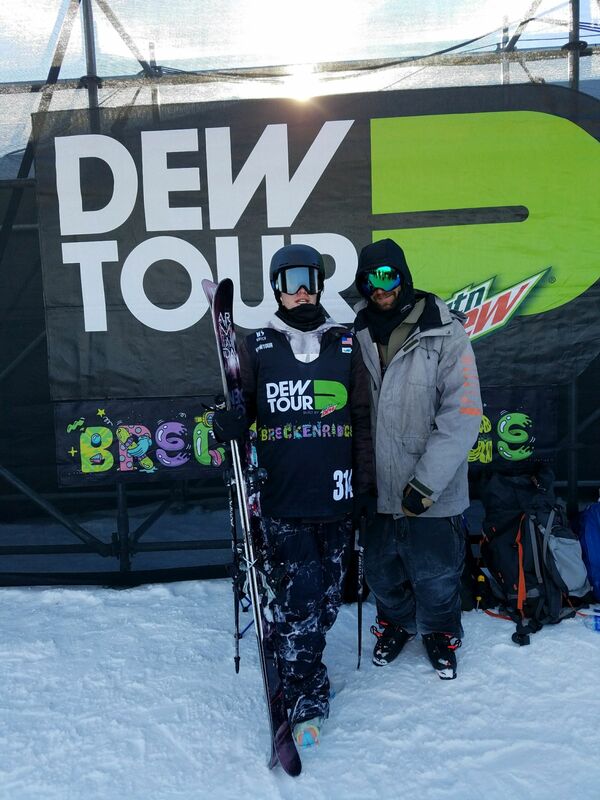 Jarrell also has been invited to next week's Dew Tour in Breckenridge, the second of the Olympic qualifiers. Jarrell has known about his Dew Tour invite for some time now, but because of an email mishap, only found out about his Copper Mountain invite over the weekend, leading to a "really big" change of plans this week. "This is kind of training for Dew Tour in a way, because I wouldn't be able to ski pipe before Dew unless I got into this," Jarrell said. "So now I at least get to get in the halfpipe and at least get some pipe training in before Dew Tour." Jarrell has been a force in smaller competitions the past couple of seasons, but never has he had the chance to compete at this level and against some of the best skiers in the country, if not the world. Ferreira, the winner of the last two World Cup events, and Yater-Wallace, who won the first Olympic qualifier last winter at Mammoth, are both competing at the Copper Mountain Grand Prix as well. Jarrell isn't holding out any real hopes of qualifying for the Olympics — the U.S. will only send four male halfpipe skiers — but also realizes the opportunity is equally his for the taking. "It's on my mind," Jarrell said. "I don't think it's realistic, but it could definitely happen. There is potential. There is a chance for everyone." Even without the Olympics, this week's Grand Prix could be an avenue for other big events. Barring a disastrous performance at Copper and again next week at Dew Tour, Jarrell is almost assured an invite to compete in front of the hometown fans at the Snowmass Grand Prix, and maybe again at Mammoth in the final Olympic qualifier. He's also holding out hope that a good performance over the next two weeks — he'll also compete in the Revolution Tour stop next week, again at Copper — could land him an invitation to X Games Aspen, long a dream of his. Regardless, this winter is shaping up to be a career-defining season for Jarrell. "It's huge for me. I'm really excited," he said. "I definitely have hopes. We'll see how it all plans out. People have done it, and I'm going to try." The Copper Mountain Grand Prix officially gets underway Wednesday with the freeski halfpipe qualifying rounds. The finals are scheduled for Friday. The Grand Prix also includes a snowboard halfpipe and big air competition. Today, December 5th, is Colorado Gives Day! Consider giving to Aspen Valley Ski & Snowboard Club today - every gift will be partially matched thanks to the $1M incentive fund! Your gift will help us provide access to the mountains for the youth of the Roaring Fork Valley, from our youngest athletes who are putting on skis or a snowboard for the first time to our older athletes chasing Olympic dreams.